Earning an affordable online bachelor's in finance can provide you the opportunity to pursue a career in banking, financial analysis, or financial planning -- and the distance format allows you to study while you work at your current job. A bachelor's of finance curriculum is comprised of broad business, accounting and economics coursework to build a solid foundation in core finance concepts. While pursuing a degree in finance, students will learn the basic principles of investing, as well as how to apply management skills and market insight to their choice of finance careers. Graduates of an online bachelor's in finance are eligible for jobs as certified financial analysts and planners, loan officers, bank managers and more. Those who graduate with a degree in finance can expect an average starting salary of $53,143, according to a 2015 survey conducted by the National Association of Colleges and Employers. Pursuing a finance degree can be a valuable investment in your future. And finding an affordable online finance program will allow you to maximize that investment by keeping costs low. However, it is important to make the distinction between the cheapest online bachelor's in finance and most affordable. While cheap programs, in terms of tuition dollars, can offer short-term savings, true affordability should factor in the long-term return on investment. In other words, can you minimize student loans and upon graduation, will you find a job that allows you to pay off your investment? 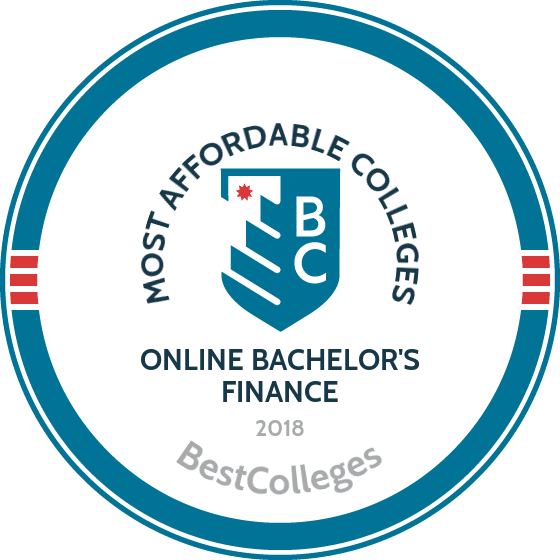 Each school in our list of affordable online finance programs meet stringent "College Affordability Score" criteria, chosen for their overall value across academic, professional and financial categories. Thomas Edison State University, located in Trenton, New Jersey, was chartered in 1972 and offers more than 100 academic programs. Many of TESU’s offerings are accessible to distance learners, including an online finance degree that prepares students to work in banking or other finance-related industries. The curriculum for this bachelor of science in business administration in finance program totals 120 hours, and students are expected to complete all major-related coursework through TESU. The program accepts general education transfer credits. Core classes include financial accounting and strategic management. Students take 18 credits in the finance concentration, which includes subjects on international business, business forecasting, derivatives, and advanced investments. The degree also requires elective hours and a capstone project. Online students have the option to pay their tuition at a per-credit rate or comprehensively, for up to 36 credits over a 12-month period. Florida International University, located in Miami, has offered distance learning options since 1998. The school has 27 remote academic programs, including a finance degree online that emphasizes technology. Students learn how to gather financial information quickly and make effective decisions in the fields of banking, financial engineering, risk management, and more. The 120-credit degree plan is divided between lower and upper division coursework. The former includes general education requirements and prerequisite classes that prepare students for advanced business topics. Courses in the major include intermediate finance, securities analysis, and commercial bank management. Elective requirements allow students to pursue more specialized topics, which include real estate and latin american finance. Tuition is priced per credit hour and based on residency status. Applicants must submit high school transcripts and SAT or ACT scores. A minimum GPA of 2.5 is also required. The University of Maryland - University College offers distance learners more than 90 online programs. Among these options is an online bachelor of science in finance that teaches students to apply fundamental theories to real-world business situations through intensive case study and group projects. The curriculum consists of 120 credit hours, 90 of which may be transferred from another accredited institution. Major coursework includes investments, financial analysis, security valuation, and organizational theory and leadership. The program is also one of the best online finance degree in terms of flexibility. Students have 43 elective hours to pursue more advanced topics in finance, a minor, or other interests. Coursework can also be aligned so that students are prepared to take the Certified Financial Planner exam after graduation. Tuition is priced based on residency status. Active-duty military personnel and veterans receive a substantial tuition discount. The University of Houston at Clear Lake was founded in 1974. Through its four colleges, UHCL offers undergraduate and graduate degrees in over 40 areas, including an online finance degree. The program prepares graduates for leadership positions through an affordable and convenient degree plan. Student can graduate in two years if they take 10 classes per year. To graduate from this bachelor of science in finance program, students must earn 120 credits. Major topics include quantitative methods for management, financial derivatives, and real estate investment analysis. UCHL caters to transfer students through its “completer” track, which enables you to apply freshmen and sophomore-level course credits towards degree completion. All major coursework is completed entirely online. UCHL has one of the most affordable tuition rate among public colleges and universities in Texas. The University of Houston-downtown, founded in 1974, boasts a 20:1 student to faculty ratio and offers a comprehensive list of academic programs for distance learners. UHD offers an online bachelor of business administration in finance that prepares graduates to work in a number of industries. Coursework is designed to train students to increase the productivity of individuals and businesses through technological solutions and financial planning. The curriculum requires 120 hours, and students have the option to specialize in corporate finance or investment management. Elective hours can be used to obtain a minor. Popular minor options for this online finance degree program include accounting, marketing, and economics. Tuition is based on state residency status. Financial assistance is available to all distance learners, including awards specific to finance majors. Northeastern University Global Network, located in Boston, Massachusetts, integrates traditional academic study with professional experience through its industry-aligned programming, professional, and corporate partnerships. Online offerings include a bachelor of finance and accounting management. The program is designed to teach students the knowledge and skills necessary to be effective leaders. Students will learn about managing budgets, leveraging assets, achieving financial efficiency quotas, and more. The curriculum consists of 120 credits and can be completed in four years with full-time enrollment or seven years of part-time enrollment. There is also a fast-track option for eligible students. The curriculum includes a capstone project in business strategy that tasks students with examining the management process. This offers students the chance to reflect on business issues while using their learned skills. Tuition for this finance degree online program is charged at a flat rate for all learners. Regis University, located in Denver, Colorado, is a coeducational Jesuit institution that offers a wide variety of undergraduate academic programs for distance learners and other nontraditional students. Facilitated by the College of Business and Economics, the bachelor of science in finance degree program is based on the most current and effective theories, techniques, and practices of corporate finance. The curriculum requires students to earn at least 128 credits. Course topics include business finance, ethical decision making, and fundamentals of investments. A senior capstone project is also required, which includes independent research and an oral defense. This online finance degree has a large elective requirement, which can be used to pursue more advanced topics in the major or to complete a minor. Tuition is the same for all distancer learners, and a variety of financial aid opportunities are available. Metropolitan State University, located in Saint Paul, Minnesota, was founded in 1971 and offers more than 60 undergraduate programs, many of which are offered online. Among these options is a bachelor of science in finance that can be completed entirely online or through a hybrid delivery method. The program teaches students fundamental financial theories and applications as well as critical thinking, leadership, and communication skills. The curriculum requires students to earn at least 120 credits. Major topics include principles of management information systems, financial reporting, and investments and portfolio analysis. Students have a number of elective options, which they can use to create a concentration area. Learners complete a capstone project in strategic management, which includes the analysis of pertinent case studies. Online students who live in Minnesota can take the Business Transfer Pathway at one of MSU’s partner institutions, this guarantees that all general education credits are accepted, and students start out as juniors. Dickinson State University, established in 1916, is located in North Dakota. The school offers a number of options for distance learners, including a bachelor of science in finance. The curriculum requires students to earn at least 120 credits. The online finance degree prepares students for a variety of positions by emphasizing problem solving. Students learn about best business practices in the U.S. and abroad. The degree plan, which is overseen by the Department of Business and Management, consists of general education courses, prerequisite requirements, and major coursework. Subject areas include organizational behavior, entrepreneurship, and corporate finance. Tuition is priced per credit and based on a student’s residency status, with discounts offered to state residents and learners in contiguous states. Old Dominion University, located in Norfolk, Virginia, was founded in 1930 as an extension of the College of William and Mary. ODU is a four-year university that offers several options for distance learners, including a bachelor of science in business administration in financial management. ODU’s program stands out among other online finance degrees due to its specialization options: finance, personal financial planning, real estate, and risk management and insurance. Choosing a concentration is required. All students take core classes in areas like investments and financial decision making, but learners who pursue the general finance track take advanced coursework in management of financial institutions, money and banking, and more. Tuition is based on residency status, and financial aid opportunities are available to all distance learners. The University of Alabama at Birmingham is the state’s largest employer -- one out of every 33 jobs in Alabama comes out of UAB. The school's distance learning programs are career-focused and emphasize experiential learning. The online bachelor’s in finance is offered through the Collat School of Business. The program fosters innovation, entrepreneurship, and leadership. In addition to general education and elective credits, students take 48 hours in major coursework. Major topics include cost accounting, financial research survey, business communications, and information systems. All students pursuing the bachelor of science in finance must complete a capstone sequence. Distance learners enjoy a variety of support, including assistance with job searches and the application process. The program is AACSB accredited and is ranked by U.S. News and World Report as one of the best online bachelor's programs. The University of Minnesota - Crookston is one of five institutions in the U of M system and enrolls over 900 distance learners annually, which is approximately half of the student body. Among the distance learning programs is a bachelor of science in finance that provides students with the education they need to succeed in investment banking, corporate finance, estate planning, and more. The curriculum consists of liberal education requirements and business, finance, and open elective courses. Students in this online finance degree are required to complete at least one internship in the field. The school helps students find internship opportunities in their area. Nearly 93% of students find work in their field within six months of graduation. Tuition is priced at a flat per credit rate for all distance learners, regardless of residency. Dallas Baptist University, founded in 1898, offers 73 undergraduate programs, many of which are accessible to distance learners, and boasts an average class size of 11. The school's College of Professional Studies offers an online finance degree. The curriculum consists of 120 credits, and at least 30 credits must be completed through DBU. Course topics include securities analysis, information systems, marketing principles, and business or public law. Over one-third of the curriculum is dedicated to open electives, enabling students to specialize in a major area or complete a minor. DBU has a generous transfer policy. The school's inverted program allows students who have extensive work experience and/or professional training in finance to receive credits and earn their bachelor’s by completing the general education courses at DBU. National University, located in La Jolla, California, offers a number of undergraduate degrees to a student population of over 23,000. The school is one of the largest higher education institutions in the United States. Through its College of Business and Management, NU provides an online finance degree that prepares students to work with corporations domestically and abroad. The curriculum consists of 180 quarter hours and includes coursework in major areas like business accounting, capital structures, and analysis of financial statements. Students must complete a capstone project that is designed to test their knowledge of the fundamental areas of finance through case studies and research projects. The school's tuition rate is the same for all online learners, and a number of financial aid opportunities are available, including institutional scholarships funded by the university. Granite State College, located in Concord, New Hampshire, was founded in 1972. The school is considered one of the best providers of online programs for its dedication to affordability, flexibility, and academic quality. Online offerings include a bachelor of science in accounting and finance that teaches students the theoretical essentials and organizational processes that are needed to manage investments and maximize the efficiencies of individuals and businesses. GSC’s online finance degree consists of 120 credits of coursework in topics such as management accounting, organizational behavior, and the legal and ethical issues in business. An integrative capstone course on strategic management is required. Tuition is based on residency status, but out-of-state tuition is not much higher. Approximately 84% of GSC’s student body are transfers. The school has a generous policy for accepting prior college work and granting equivalent credit for work experience and military and professional training. Northwood University, located in Midland, Michigan, was founded in 1959 and provides an education that creates future leaders and honors the idea of a globally-focused free enterprise society. Among Northwood’s online options is a bachelor of business administration in finance that prepares students to work for individuals, small businesses, and multinational corporations. The curriculum requires students to earn at least 123 credits and includes courses in analyzing capital markets, real estate finance, and international trade. Remote courses are offered throughout the year and can be completed in six weeks, enabling students to earn their degree faster. Northwood also allows eligible students to complete a four-year accelerated track that earns them a master of business administration in addition to the online bachelor’s in finance. All distance learners pay the same tuition rate, and a number of financial aid opportunities are available, including scholarships. DeSales University, located in Center Valley, Pennsylvania, was founded in 1965. The school offers a comprehensive catalog of undergraduate and graduate programs, including one of the best online finance degrees in the state. The program focuses on the ethical implications of financial and business transactions. Students may pursue a generalist degree or an accelerated financial planning track. Both paths consist of 120 credits and include courses in quantitative business analysis, portfolio management, marketing, and principles of management. The curriculum has a large elective requirement, which students can use to complete a minor. DeSales allows students to transfer up to 75 credits (or 25 courses) from previous college-level work. They may also gain equivalent credit through the prior learning assessment process. Missouri’s Columbia College enrolls over 5,500 distance learners in its associate, bachelor’s, and master’s programs. The school offers two online finance degrees: the bachelor of arts in business administration (BABA) and the bachelor of science in business administration (BSBA). Both program provide students with the fundamental knowledge and skills to acquire entry-level work or advance in the field. Graduates are prepared to work for businesses, the government, and nonprofit organizations. The BABA emphasizes the liberal arts, while the BSBA focuses on mathematics and analytics. Both degrees are grounded in the business core, with shared coursework in areas like strategic management, marketing, and business law. Applicants should consult with an advisor or a faculty member to discern which degree aligns with their interests and goals. Tuition is affordable and priced at the same rate for all distance learners; military students receive a discount. Missouri State University - Springfield was founded in 1905 as a normal school that prepared teachers for the regional public school systems. The school offers a large and varied list of academic programs, including an online finance degree. The program prepares students to work in credit management, real estate, banking, corporate and public finance, and more. In addition to general education and core business requirements, students also complete 32-33 credits in the major. Courses include fundraising principles and professional financial planning. Students have the option to take coursework that prepares them for the Chartered Financial Analyst exams. Online tuition is priced at the same rate regardless of residency status. Financial assistance, including specific awards for transfer students, is available. Academic support includes the Business Advisement Center, which provides mentorship for students in the College of Business. Franklin State University, located in Columbus, Ohio, was founded in 1902 to serve the needs of adult learners and other nontraditional students. FSU offers degrees at every level, including two options for students interested in an online finance degree. Through the Ross College of Business, students may pursue a bachelor of financial planning or financial management. Both tracks are grounded in key business theories and best practices. Students who pursue the financial planning option prepare themselves for careers as advisers who help individuals, families, or entire organizations plan for their future. Financial management majors learn how to analyze a company’s overall performance to reduce risk and ensure financial well being. Both tracks require students to complete a minimum of 120 credits; at least 30 credits must be earned through Franklin. Students are required to complete a capstone project or experience. Online students, regardless of their residency status, pay the same affordable tuition rate. Pennsylvania State University is part of a 24-campus system that enrolls more than 100,000 students annually, many of which are distance learners. Penn State has a vibrant online education portal, called the World Campus, that offers a comprehensive catalog of remote courses and programs, including a bachelor of science in finance. The curriculum provides students with a foundation in business and financial practices, preparing them for advanced positions in banking, security analysis, personal financial planning, and more. Penn State’s online finance degree also caters to pragmatic professional goals and prepares graduates to sit for the Certificated Financial Planning and Chartered Financial Analyst exams. Students must earn a minimum of 120 credits. The tuition rate is priced the same for all distance learners; part-time learners will pay slightly more per credit. Upper Iowa University, located in Fayette, was founded in 1857 and enrolls more than 1,200 distance learners annually. Remote programs include a bachelor of science in financial management that helps students succeed in personal financial advising, banking, risk management, service sales, and more. In addition to general education requirements, students taking this online finance degree must complete 54 credits in the business core and financial management major. The core and major courses teach learners to lead effective teams, create and understand financial statements, and assess the financial opportunities of an individual or business. The curriculum includes at least one internship experience and a capstone project, both completed with the guidance of a faculty adviser. Online tuition is priced per three-credit course and does not change based on a student’s residency status. Southern New Hampshire University, located in Manchester, offers accessible and career-centered programs through its main campus, regional education centers, and online platform. Online offerings include a bachelor of science in finance. The program teaches students to quantify, make, and manage monetary assets in a variety of business environments, including startups, investment firms, and multinational corporations. The curriculum consists of 120 credits in general education, business core, major, and free elective courses. Students must complete an undergraduate finance capstone, which has them integrate the skills and knowledge obtained through the online finance degree. There is also an option for students to specialize in financial planning; students who choose this track forego their electives for specified advanced coursework. Tuition is priced at a flat per-credit rate for all online students, and financial assistance is available. LeTourneau University, located in Longview, Texas, was founded in 1946 as a technical institute for male students. Today, it’s a coeducational institution that serves the academic and professional needs of all learners. Among the degrees offered at LETU is an online bachelor’s in finance that emphasizes key leadership and strategic decision-making skills, preparing students for careers in a variety of industries. The curriculum consists of 120 credits of general education and major courses. Students also take 12 credits in the finance concentration, with course topics like investments, financial strategy, business forecasting, and risk analysis. Students have the option to pursue a minor, popular options include marketing, accounting, and nonprofit management. LETU charges the same per-credit online tuition rate regardless of residency status. A number of financial aid opportunities are available, including federal loans and institutional scholarships. University of the Southwest, located in Hobbs, New Mexico, was founded in 1962. The school offers a number of academic programs for distance learners, including an online finance degree that emphasizes the understanding and implementation of quantitative analysis tools. The curriculum consists of 120 hours and includes general education requirements and core business classes. Core courses teach students how to build effective business plans. Learners also complete 30 credits in the finance emphasis. Finance coursework includes global finance, strategic planning, and managing effective organizational teams. Students can focus on particular subjects through electives. Online tuition is priced at a flat per-credit rate for all distance learners. Academic services include online tutoring through the Khan Academy and virtual math labs.